Pensacola’s best parading Mardi Gras Krewe’s will have their float and their entire Krewe on Palafox and Government Streets, where their Krewe will be ceremoniously blessed and proclaimed ready to participate. Each Krewe will be in costume and will have it’s royalty present. The Father, along with the Town Crier T. Bubba Bechtol, will bless each individual float, the City of Pensacola, and the entire Pensacola Mardi Gras season. Come out and join us for FREE King Cake provided by Bluejay’s Bakery, and dance the night away with a second line jazz band street performance. The party starts at 5:30 pm. Local Krewe’s have been gearing up all year in preparation to unveil their float’s new themes and colors; not to mention the Krewe members elaborate costumes! 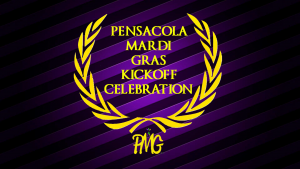 This is a chance for all Krewe’s and all of Pensacola to join together and ring in the Mardi Gras season.